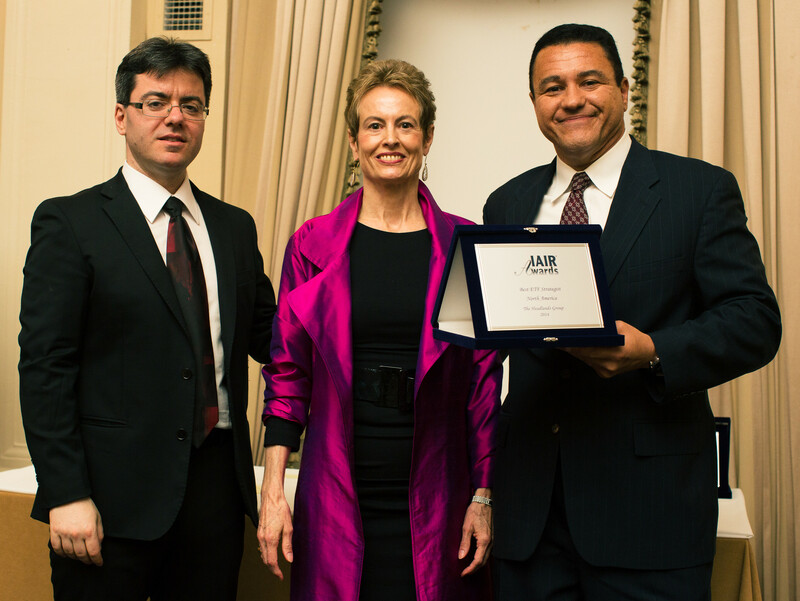 New York, April 15th, 2014 – The Headlands Group, a leader in the use of Exchange Traded Funds (ETFs), received the award for Best ETF Strategist in North America at the IAIR GLOBAL AWARDS® 2014 – New York Edition, held at the Yale Club in New York City. The Headlands Group was recognized for being a pioneer in ETF investing and for continuing to lead the industry through education and innovation. The IAIR awards recognize Excellence in Global Economy and Sustainability. Winners are chosen by vote of a team of legal, economic and financial journalists in over 120 countries worldwide. “We are pleased to receive this prestigious award on behalf of the company. Our innovative use of ETFs in their portfolios has been critical in helping us serve our clients for many years. Recent growth in ETFs has allowed us to make institutional-quality investment management available to a broad, under-served investor base as well as to the advisor community,” said Ms. Terry O’Neill, President (center). “This award recognizes the steps we have taken in the past year to further this effort,” added Mr. Kal Salama, Chief Investment Officer (right). The Headlands Group first used ETFs to improve its clients’ global portfolios in the late 1990s. As ETFs grew in popularity and use, it has sought to educate the industry by publishing its best portfolio-building practices. The Headlands Group was first registered as an investment adviser in 1985 and is based in Larkspur, California. It provides institutional quality global investment management to high net worth individuals and small institutions. Among the categories considered for the IAIR AWARDS® are the following: Green Economy, Alternative Investments, Business Opportunities, Foreign Exchange, ETFs, Commodities, Law, Asset Management, Family Office and Wealth Management, Philanthropy, Private Equity, Real Estate and Property Management. “IAIR AWARDS is constantly seeking excellence in all places, whether small or large, national or international companies as well as companies operating in niche areas. It is very important that we value and recognize those services of businesses for their high contributions to their communities and the world,” commented Mr. Guido Giommi, Chairman of IAIR (left). The IAIR AWARDS® ceremonies honoring regional winners are held in global financial centers such as Hong Kong, Dubai, London, São Paulo, Milan and New York. The Award ceremony has a special partnership with the Financial Times, Harvard Business Review and other global financial magazines. For more information about the IAIR awards, visit www.iairawards.com under Asset Management. ETFs combine the broad diversification of conventional index mutual funds with the continual pricing and trading flexibility of individual stocks and bonds—generally at a lower cost than conventional funds. The increasing popularity of ETFs has given rise to a new type of asset manager: the ETF Strategist. ETF Strategists generally seek to minimize risk, improve diversification, and seek alpha (incremental return) by selecting and managing exposures using ETFs rather than through stock or other security selection. These specialists bring deep knowledge of ETF portfolio construction and trading experience to the marketplace, and the use of their expertise is growing. Worked closely with an author to publish a book that educates potential users of ETFs. The book, ETF Investment Strategies includes a full chapter featuring The Headlands Group approach as a case study. Used our website to build an educational/support library for potential investors. Embraced the classification – ETF Strategist, recognizing we were a strategist long before the term was coined. Adopted the institutionally accepted Global Investment Performance Standards (GIPS) throughout the firm. Expanded the business into a new distribution model to meet the needs of a broader investment audience. Pursued the possibility of launching a family of its own ETFs with potential partners – estimating costs and evaluating implementation issues.